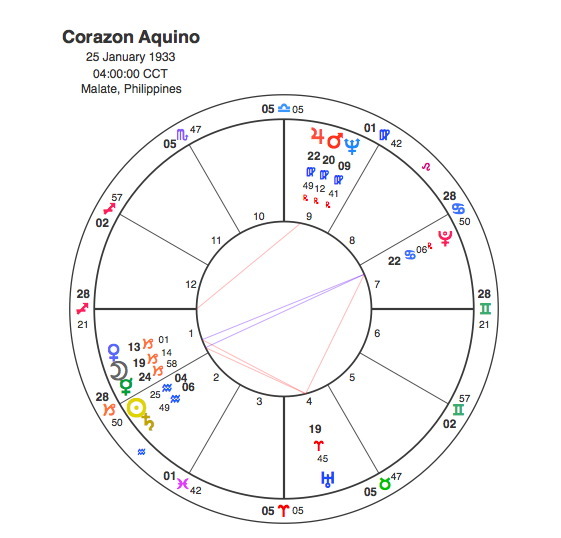 One of the best examples of the power of a Pluto transit is in the life of Cory Aquino. Pluto’s energy is swift, sudden and dynamic. It works like an atomic explosion completely clearing away past conditions, sometimes in a quite destructive manner in order for a fresh start in a completely new direction. Pluto’s transit to the Sun invariably marks the major turning point in a person’s life but the scale of the drama usually depends on how strong Pluto is in the birthchart. Cory Aquino had quite a difficult chart. She had a stellium ( multiple conjunction of planets ) including the Sun in early Aquarius and the Moon in late Capricorn. The Sun is conjunct Saturn and this aspect usually brings an acquaintance with the harsher side of life. The tough thing about her chart is that all the planets in the stellium are in opposition to Pluto, and this aspect creates a T Square with Uranus. The sudden drastic change in her life that Pluto indicates would inevitably be very powerful and difficult because the aspect is an opposition and it would affect so many parts of her life as it opposes 5 planets. Pluto is in the 7th house so the change would be centred around her marriage. The opposition focuses onto Uranus, another planet of sudden, unexpected change in the 4th house so this aspect would focus on her family life and shake her to the very core. Both Pluto and Uranus demand something new which would rise, Phoenix like out of the ashes of the old life. Cory Aquino came from a wealthy Filipino family, she was the wife of a journalist and aspiring politician. A homemaker, modest, shy and conservative, for almost 30 years she lived a simple life in the shadow of her husband away from the political world. By the early ’70s, Cory’s husband Benigno Aquino seemed sure to succeed Ferdinand Marcos to the Presidency when his final term expired in 1973. Marcos, however declared martial law and imprisoned Benigno for seven years. In 1980, Benigno was permitted to go to Boston for heart surgery. When he returned home in 1983, he was shot in the head as he left the aircraft. In 1986, Cory found herself under tremendous pressure to run against Marcos, and with popular support broke the dictatorship to become President. It goes without saying that Pluto was square to her Sun in 1985 and 86. Pluto’s transit was the only one to her Sun in her life. It came at the end of a series of transits to all the other planets in the T Square which began in 1976 whilst Benigno was in prison. This is the range that Pluto has, it can suddenly propel someone from obscurity to the highest office by the most drastic of means. For Cory Aquino it turned a terrible personal tragedy into a great triumph for herself but also more importantly for the people of the Philiipines as democracy returned to the country.